EuropeFX is an international Forex CFD broker, that is licensed and regulated in Australia and Europe. They are owned and operated by: MaxiFlex LTD, which is located at: 46 Ayiou Athanasiou, Interlink Hermes Plaza, First Floor, Office 102, CY-4102, Ayios Athanasios, Limassol, Cyprus. Contact phone number from United Kingdom is: +44 870 820 0200, and Australia is: +61 28 016 4777. Customer support email is: support@europefx.com. Official website sites are: Europe: https://europefx.com/ and Australia: https://europefx.com.au/. Warning! Do Not use an Algorithm trading software, until you read this! Investors at EuropeFX are given access to the MT4 trading platform, which has a Web Trader and mobile apps for Android & iOS. They offer a wide variety of assets to trade including; Forex / Currency pairs, Commodities (oil, gold silver), Indices and CFD’s for shares trading. Commissions are 2 pips per lot, and the maximum Leverage is limited to 30:1 due to ESMA rules. The website is available in the following languages; English, Italian and German. You can create multiple demo trading accounts to test out the platform and your trading strategies, register here. 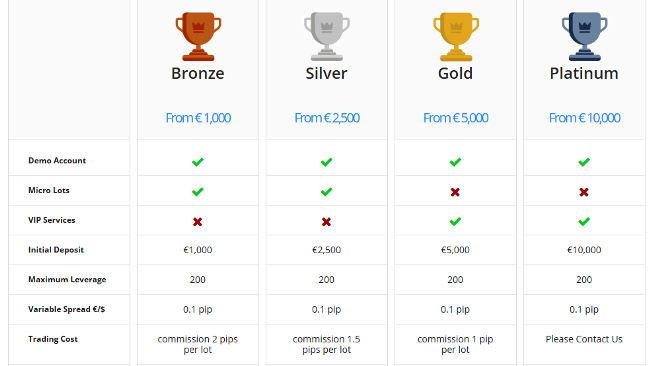 The minimum required deposit for a the smallest “Bronze” account is €1,000, which i very high. At a broker like ForTrade, you can start trading with just $100. 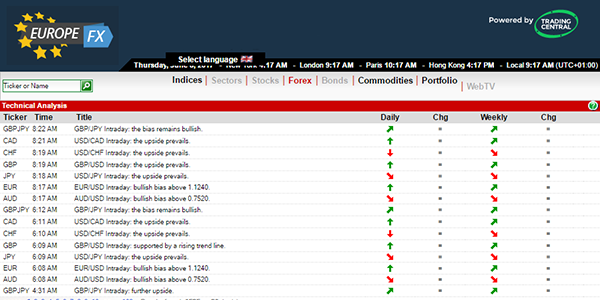 Once you have created your account, and logged in, you will see that EuropeFX provides free access to Trading Central. Trading Central is a popular system which analyzes all markets and give investors alerts and signals for potential trading opportunities. The way you know a Forex broker is not a scam is by checking their regulatory status. When you see that they hold a valid license from a financial regulator, you can be sure that they are a legitimate broker. A CySEC licensed broker can offer brokerage accounts to all countries that are members of MiFID in the European Union. EuropeFX is a legal CySEC regulated Forex broker, since they received license number 258/14 on November 10th 2014. You can see their official license on CySEC’s website. In Australia, they are operated by: MAXI EFX GLOBAL AU PTY LTD, Suite 21, Level 1, 23-29 Hunter Street, Hornsby NSW 2077, Australia. There are many Forex brokers to compare and choose from online. ForTrade is a popular online broker, with a license in Australia and the United Kingdom, see here. You get an easy trading platform, and Free Demo Accounts. Read more at: ForTrade.com. What was your trading experience like with the brokers at Europe FX? Write your review in the comment section below.